Sembach AB, also known as Sembach Kaserne, is located in Sembach, Germany. 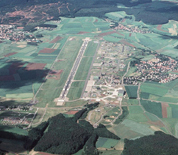 It is a short distance from Kaiserslautern and Ramstein Air Base. It had been a USAF base until 2010 and now serves as an installation for the US Army. The base is used to house US Army military personnel and offers support facilities including a commissary and schools. Units stationed at Sembach include the Army's 230th Military Police Company and the 30th Medical Command. This Sembach AB directory features the critical info you’ll need to navigate through the many facilities and recreational opportunities available on base.